Let Canva help you think outside the bottle and design a label that connects your vintage to your personal brand. No matter what style of wine you are – red, white, light, full-bodied, or bubbly, Canva can help you get your wine label design right. And if all great design starts with a great concept, then our beautifully designed wine-themed labels are there to get you going. Our drag-and-drop design tool means you can also customize your label as much – or as little – as you like! Choose complementary fonts to create an ornate, classically themed design inspired by Old World wine labels or maybe go for something altogether more funky and fun. Use Canva’s drag and drop design tools to create a design that reflects your personal vintage. Create a new Canva account to get started with your own Wine Label designs. Choose among the many amazing label templates to put on your wine bottle by customizing the various design elements within the layout. Our library of over a million stock photos, images and design elements makes it easy to add your own touch. If the free images are not doing it for you, our premium ones cost just $1 for each one time use. You can also upload your own logo, photo, or even one of your own illustrations. Whatever it is, just drag and drop them into your design and tweak away until it looks spectacular. When you are done, don’t stop there. Tell the world, or at the very least your friends and family. If you are a budding wine entrepreneur you might want your fellow oenophiles to see what you can do. Even if you’re working with a team on the other side of the world, Canva makes it easy to collaborate on designs. Click ‘Share’ to email it directly to a contact or send a link to anyone who needs it. You can even ask for comments on your masterpiece. And if you really want to share your design with the world, then getting it onto Twitter or Facebook takes just another click on the ‘Share’ button. Getting your design off the screen and onto your bottle is as easy as clicking the ‘Download’ button. Save your design as a high-quality PDF to print at home or at a professional printer. And you’re all done! All that’s left will be to celebrate and raise a glass to your newly labeled wine – cheers! How can I add branding to my Wine Label design? Create a Wine Label that’s instantly recognizable by uploading your logo, using your brand color palette and consistent fonts. How much does it cost to create Wine Labels in Canva? 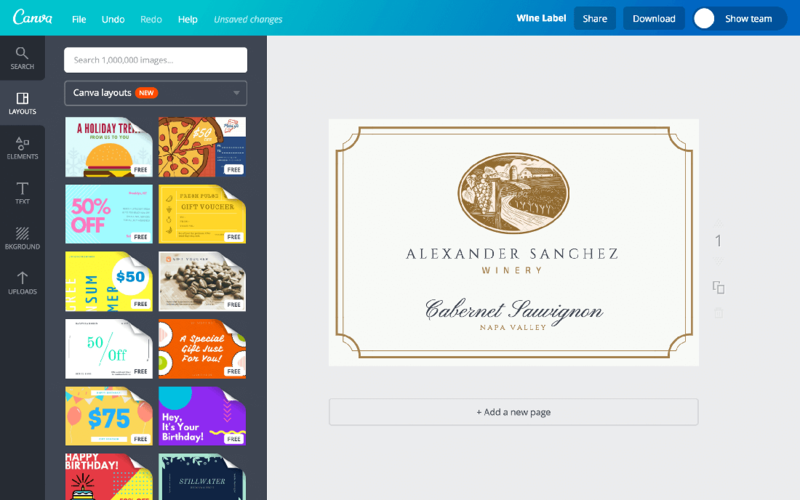 Designing Wine Labels in Canva is free! Our library of card layouts have been created by awesome designers, making it as simple for you as a few clicks to create a professional design. If you use your own images in your design, the entire process will be free.